A friend and I went to the Opening Night Preview Party of the inaugural Interior Design Show West that was taking place at the Vancouver Convention Centre. My strong interest in interior designing and the proximity of the convention centre to my workplace spurred me to attend the event. My desire was further enhanced upon discovery of some interesting statistics which stated that over 70% of attendees would be females with post-secondary education and incomes over $100,000. After entering the convention hall, I was also able to verify that 70% of attendees were over the age of 50 as well. There were many pieces of art and furniture on display. I was particularly impressed by the Dyson Airblade touch free hand drier which works in 12 seconds. Honourary mention goes to a picture frame with a digital screen that allows you to display any piece of art that is available in its catalogue. The overall theme seemed to be 'Green Living' with wood and stone being prominent elements in many of these exhibits. Live music and painting, both on canvas and on bodies, rounded out the event. ResponseTek is a leader in collecting real time feedback from customers of large scale firms. After a graphically gifted associate of mine created a composite image containing side by side before and after pictures of me, I posted it on a popular social networking site. Following in my company's footsteps, I was able to informally gauge popular opinion on the transformation of the ARNABody. The results were surprising. Although only two options were presented, to my astonishment a write-in option also gained considerable support from the masses. Trading in the physically exerting role of globetrotting adventurer for that of an office dwelling software engineer has taken a toll on the wondrous ARNABody. The attractive structure is increasing in mass at an alarming rate of 2-2.5 pounds a month. My Adam's apple has receded and my rugged jawline has become soft and rounded. To alleviate my concerns, a chubby coworker cheerfully declared that "You're only fat if you feel fat". He also mentioned he has not seen his Adam's apple in years. Some of my colleagues attributed my rapid swelling to my "pregnancy". Just as female frogs change sexes and transform into male frogs when the female:male ratio is unfavourably tilted, they hypothesized that I am also mutating due to the extreme workplace ratio that is prevalent in the IT industry. My frequent cravings for poutine and other edible heavenlies was pointed out as further evidence in support of this gender jumping theory. The strength of the scientific community lies in its ability to constantly redefine thought processes and belief systems based on new discoveries or paradigm shifts. With the emergence of the ARNABeauty and ARNABombshell terminology in popular culture, the role of the ARNABabes in society must be redefined for proper distinction. Let the universal set of available women in the age of youth, blessed by adequate mental faculties and endearing aesthetic features be known as ARNABabes. A subset of ARNABabes, the ARNABeauties, will possess unique internal qualities or traits that intrigue me enough to warrant further investigation. Another subset of the ARNABabes, the ARNABombshells, will be blessed with generous physical attributes, grace, and style that invigorate my very being. The set formed by the intersection of the ARNABeauties and ARNABombshells shall form the set of ARNABride candidates. 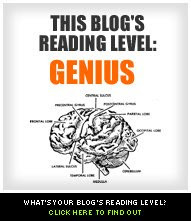 I applied the Blog Readability Test to ARNABlog to measure the intellectual capacity of my readers. A reading level equivalent to that possessed by a genius is required to comprehend the full depth and breadth of ARNABlog according to the test results. I could not find a corresponding tool to gauge the writing level of the blog author but I would assume it is greater than or equal to the reading level. If you are a foreigner planning to work, study, or travel within India for more than 180 consecutive days without leaving the country, then you are required to register your details with the closest Foreigner's Regional Registration Office (FRRO) or Foreigner's Registration Office (FRO) within two weeks of your arrival. Five other law abiding non-citizens and I decided to fulfill our legal duty soon after our arrival in Hyderabad. Our first stop was Satyam City Center in Begumpet (across the street from popular department store Shopper's Stop). One of the better furnished Satyam office's, here we picked up letters attesting to our proof of employment and other required documentation. With documents in hand, we arrived at the police headquarters. We were promptly directed towards the authorities responsible for foreigner registration. Initially reluctant to process our documents since we had arrived after lunchtime, after some light persuasion they agreed to do what they could. We were herded into a crowded room with boxes full of overflowing stacks of paper and rows of men with stamps. They inspected our documents, frowned, and approved them with authority. We were then told to wait outside. Several hours later a kindly clerk gave each of us slips containing an identification number and a date when a letter stating that we had registered with the FRO would be ready for pickup. This letter is collected by Indian authorities when you are leaving the country. If you do not have this document then, you may be deported from the country as punishment. Unfortunately before my letter was ready, I had been transferred to Bangalore and did not get the chance to pick it up. After I had alerted Satyam's foreign affairs department that I had not transferred my registration from Hyderabad to Bangalore, they directed me to do so post haste. I made my way back to Hyderabad for 5 days, spending a few extra days reuniting with old friends, eating biryani, and inspecting pearls. The FRO had relocated from the old police headquarters to an even older one so the surroundings were once again unfamiliar. The officers in charge were disgruntled at first since I did not have my identification slip and gave me a lecture about irresponsible foreigners thinking they can come to India and do whatever they want. They saw my passport and then lightened up when they realized I was a Bengali. After explaining the Satyam diet and why I looked different from my picture, they allowed me to bypass the long lineup so that I could immediately finish my paperwork. The staff were friendly and helpful, especially the ones that were not snoozing or reading the newspaper. They passed around my picture and chuckled. First I retrieved my letter stating I was registered as a foreigner in Hyderabad. Then I applied for deregistration from Hyderabad. After I was granted this, I requested that my information be forwarded to Bangalore so that I could register there. I did not want to further increase India's population count by being registered at more than one place at a time. Back in Bangalore, I went to the FRO and let them know that I had given them permission to receive my original paperwork from Hyderabad. They stamped my documents and told me to write a letter to the Hyderabad FRO stating that the Bangalore FRO had noted my arrival and were ready to receive any documentation that they may have concerning me. I followed instructions, but several more trips to the FRO were in vain as the documents never arrived from Hyderabad. The on duty clerk finished his crossword puzzle and informed me that there was no problem and whatever documentation I had collected over the year would be enough to ensure my departure from India.